Today, Finch is helping bring that same combination of convenience, comfort and smart food choices to others. She’s a personal chef, food blogger, and winner of Thrive Global’s Instagram contest, in partnership with Well Yes! Here, Finch shares her insights on starting off the morning right, the importance of listening to your body, and why making smart choices is all about preparation. I gain energy from food, nature, and working out. Healthy food makes me feel so good and energizes me for the day. I grew up in Monterey, CA, went to college in Denver, CO, and currently live in Reno, NV, so nature is super important to me. I love being near hiking, skiing, and other outdoor activities. Getting outdoors is so refreshing and it invigorates me. When I need inspiration for my life or business, I go outside, whether actually hiking or just sitting in the sun with a notebook. Working out takes energy but gives me so much energy. My favorite way to work out is to incorporate the outdoors and exercise. I also love to swim. How do you say yes to smart food choices? Smart food choices start with meal and snack prepping. If I do not have food on hand then it is so easy to get off track. For me, it is all about starting the day on a healthy foot. Avoiding sugar in the morning is huge because if I have sugar too early, I crave it all day. I typically have a piece of whole wheat toast, homemade crumbled pork sausage or herbed deli turkey, and a fried egg. It keeps me full and ready to start the day. My favorite food is shrimp. I love shrimp prepared pretty much any way. My recent favorite is blistering cherry tomatoes with shallots, olive oil, garlic, white wine, and chicken stock and then adding shrimp at the end for a flavorful dish. This is perfect served over brown rice with a side of roasted vegetables. I love fresh produce. I grew up in Monterey, CA, so I was always surrounded by fresh produce, which made it easy to incorporate fruits and vegetables into my diet. Moving away from that area was difficult because the quality of produce and the variety were not as good. I can’t stand pickles. Anyone who really knows me knows that I don’t like them. I like pickled vegetables and raw cucumbers but something about pickles I do not like. How have your food choices and eating habits changed over time? As a child, I was a very picky eater. If we went out to dinner as a family, my parents would have to call ahead to make sure they had chicken tenders, a food I still love and appreciate. Both of my parents are great cooks so having picky children (my two siblings were also picky) was very frustrating. As I grew older, I started trying and enjoying more foods. I became interested in cooking as a child and cooking was a good way for me to try new foods. I still have a few foods I avoid and prefer some things prepared simply but have come a long way. What’s your most important meal of the day? That’s a tough question since food is my favorite thing but breakfast is probably the most important for me because it gets me started on the right foot. Without breakfast, I struggle to make healthy choices the rest of the day. What’s one thing you’d like to change about your eating habits? I wish I was less susceptible to the pulls of sugar. I have no shame in admitting I love sugar especially candy, ice cream, and baked goods, but sometimes I overdo it and feel terrible. Otherwise I try to eat intuitively. If I am hungry at 11am, I will eat lunch. If I am not hungry for lunch until 3pm, then I will eat then. I try to listen to my body. How do you say yes to smart food choices in ways that fit your lifestyle? What are the daily eating habits that help you thrive? Use the hashtag #WellYesThriver to share your story. For ideas and inspiration, you can learn about delicious Well Yes! 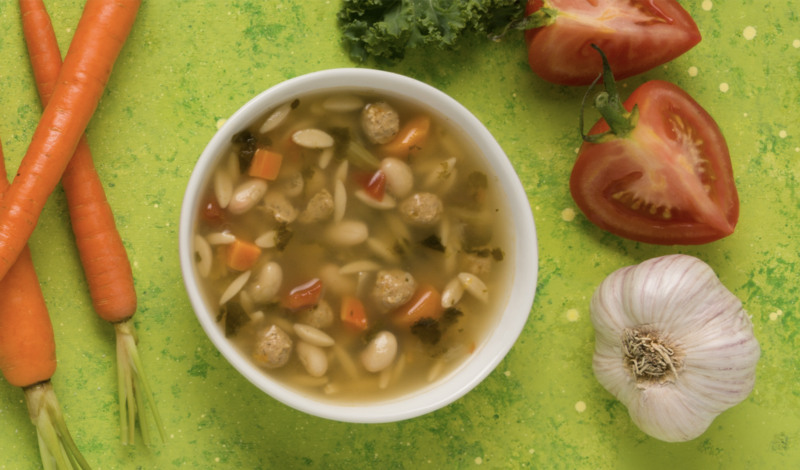 soups that feature nutritious, delicious ingredients here.